Review Snapshot: A wise academic once professed that true art should be recognised for its aesthetic value rather than any contrite notion of commercial viability. Ayoe Angelica personifies this perspective, producing an enchanting collection of songs that captures the spontaneity and experimental side of the artistic process. Full Review: In a consumer-driven industry, the artistic quest for originality seems to have taken a backseat to the marketable value of music. Many virtuous acts venture into the depths of big business determined to preserve their integrity only to bow to the burden of systematic sales targets and creative constraints. Our hopes lie with the treasured few who flee from the arid mainstream in favour of the road less travelled. 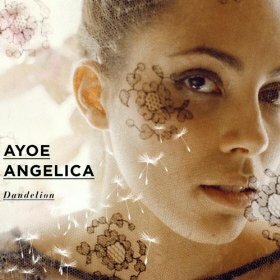 Genre-defying Danish singer Ayoe Angelica is one such individual. Joining forces with multi-instrumentalist B.B Krog, the pair produced a poignant and multi-dimensional debut in the form of 2008’s I’m Amazed; an album that tastefully balanced elements of electronica, jazz and downtempo without necessarily claiming any particular label. Two years later, their second effort, 'Dandelion', is an affirmation of artistry, melding the musical melancholy of Portishead with the salacious side of early R'n’B. The candescent “Cupid” is a smooth and lugubrious conflation of genres, unfolding and evolving with each passing second. The track opens in a downtempo vein reminiscent of Massive Attack’s collaborations with Liz Fraser, with a moog organ bringing a touch of seventies soul to proceedings. The middle section comes straight out of left field with a searing slice of shred guitar plucked from the fingertips of an 80s virtuoso. Ayoe’s loquacious lyrics carry a certain cabaret charm, counterpointing Krog’s introspective instrumentation. The individuality of each rhythm track slowly surfaces with each sequential spin. Not content to merely surrender to the mechanisms of a drum machine, Krog crafts a beat for each song by sowing several percussive samples together. “Make a lap” draws out the taut intonations of a double bass, creating the perfect 50’s shuffle for Ayoe’s vaudeville-like vocals. “Plenty more fish” forms an intriguing intersection between R'n’B and contemporary electro. The call and response intro unfolds into a rhapsodic verse, akin to Rihanna’s current output. The lower frequencies reveal the organic sound of a double bass sliding amorously up the minor scale, while high above orchestral samples weave with a tapestry of textured tones. “Girls are like apples” tumbles down the rabbit hole into the labyrthine lair of experimental electronica, replete with pitch-shifted vocals and hauntingly repetitious harmonies. The minor melodies bear a passing resemblance to the macabre meanderings of Danny Elfman, capturing the lighter side of the gothic sound. The slowing burning “Quiet Cafes” reveals Ayoe’s traditional roots, with the waltzing rhythm adding a touch of country to this sonorous serenade. The track gradually reveals its jazz sensibilities, peeking in the middle with a lounge-style saxophone solo harmonising with the main vocal melody. The pair’s divergence from the electronica template here highlights their versatility as songwriters. They display an uncanny capacity to transcend the conventionally concrete boundaries between genres, producing a multi-faceted sound that is complex and yet accessible. A wise academic once professed that true art should be recognised for its aesthetic value rather than any contrite notion of commercial viability. Ayoe and Krog personify this perspective, producing an enchanting collection of songs that captures the spontaneity and experimental side of the artistic process. And by abandoning the concern of appealing to everyone, the duo comes closer to the goal than most musical merchants.